November 5, 2018: Continuing the great streak of success and achievements by maintaining the standards of excellence and innovation through campaigns that were launched throughout the year, the Red Sea Mall in Jeddah was crowned with the “ICSC Foundation” prestigious award and the RECon MENA awards at a ceremony (The Middle East and North Africa Retail and Shopping Center Awards 2018) held on October 30 at the Ritz-Carlton, Dubai International Financial Center. The awards, organized by the International Council of Shopping Centers (ICSC) and the Middle East Council of Shopping Centers (MECSC), are designed to recognize the most successful retail and retail centers, to boost net operating income, and to design and develop shopping centers. 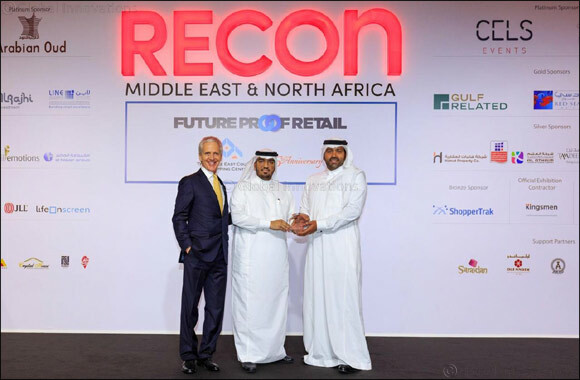 An international committee composed of global and regional experts in the areas of shopping center development, marketing and operational process has selected the winners of this year's Middle East and North Africa Retail and Shopping Center Awards to ensure that global best practices are applied. Commenting on the achievement, Mohammed Alasiri, Marketing Manager at Red Sea Mall, said: 'We are extremely proud to win these valuable awards, which underscore the effort exerted by everyone to achieve this excellence and uniqueness. These awards will be added to the record of success that the Center has achieved through the efforts of the team who have become experts in organizing campaigns and events that engage the community and set higher standards in marketing and entertainment, in line with the progress of the Saudi Vision 2030”. 'The competition to win these awards has been great, not only locally but also in the Middle East and North Africa, and we have surpassed many of our competitors and achieved this recognition for the great achievement which motivates us further to introduce programs and events that raise awareness among the community and stand out in the industry with unique engagement and entertainment for all segments of the society. As we celebrate this success, we emphasize our keenness to delight all visitors to the centre from inside the Kingdom as well as from abroad, especially that Jeddah is the gateway to the two holy mosques and receive visitors throughout the year”, added Alasiri. Red Sea Mall won the “ICSC Foundation” award for the 'ITAA'M' project within the cause marketing category, especially that the mall see Corporate Social Responsibility (CSR) not just about charity and volunteerism, but also includes responsibility for the community through the adoption of many development projects and awareness programs that contribute towards sustainability, which lead to the cooperation with “ITA'AM and serious works and achievements has been going for the past 3 years. The “ITA'AM” project was submitted under the ICSC Foundation awards that presents seven regional Community Support Awards annually. Red Sea Mall received industry-wide exposure and a $10,000 USD grant to their partnering charity “ITA'AM”. The mall will automatically be eligible for the prestigious Albert Sussman International Community Support Award which includes an additional $15,000 USD presented at RECon Las Vegas. The mall also won the traditional marketing award for its promotional & marketing campaigns: 'Red Sea Mall Cup' organized during the World Cup 2018 within the category of sales promotions and events. Red Sea Mall successfully competed with Sharjah Shopping Centre, Ajman City Centre, and the Fujairah Centre City of Majid Al Futtaim Properties, “The Mall” at World Trade Centre and Yas Mall of Aldar Properties in Abu Dhabi. Also participating in the competition were Dubai Festival City, a subsidiary of Al Futtaim Properties Group, as well as the Amman Avenues Mall, of Lulu International Group. In addition to the Galleria on Al-Mariya Island, of the Gulf and Mubadala Real Estate and Infrastructure Company in Abu Dhabi, also competed with Dalma Mall of Abu Dhabi Developers Company, Arab Centre of Lalz Group in Dubai, BurJuman Centre of Saif Al Ghurair Group in Dubai, Cairo Festival City Mall, Al Futtaim Properties Group in Egypt, Bahrain City Centre, Deira City Centre, Mirdif City Centre and Mall of the Emirates of Majid Al Futtaim. And finally, competed with Roshan Mall Plaza Mall, Aliat Mall of Kinan International Real Estate Development Company and many other local and regional companies and centres. The Red Sea Mall is the main entertainment hub in Jeddah and is a popular tourist attraction for individuals across all ages. The Center hosts various activities, festivals and national entertainment events throughout the year, sometimes exceeding 450 activities. It sponsors and supports awareness-raising activities, making it the main shopping and entertainment destination for the residents and visitors of Jeddah.